Enrollment for Spring 2019 classes is now closed. For more information about our Light Microscopy certificates, please contact Program Assistant and Student Liaison, Feather Ives, at feathermerritt@gmail.com and cc program director, Dr. Gisele Giorgi, at ggiorgi@peralta.edu. Please check back soon for Summer 2019 course information. To join our mailing list for incoming students, email Feather Ives, at feathermerritt@gmail.com. Microscopy is the art and science of taking accurate, informative and often beautiful images using a microscope. Microscopes enable us to see into a world otherwise hidden from the naked eye. Today’s digital microscopes allow us to see into a world at the farthest edges of our curiosity. It’s a golden age for microscopy, as fantastic new imaging tools are rapidly developed and implemented in a wide variety of scientific fields, which include biotechnology, biomedical and academic research, forensics, and materials science. Click here for the Histotechnology website. Click here to find out more about the Biosciences at Merritt College on Peralta Matters, the District’s television show hosted by Chancellor Jowel Laguerre. 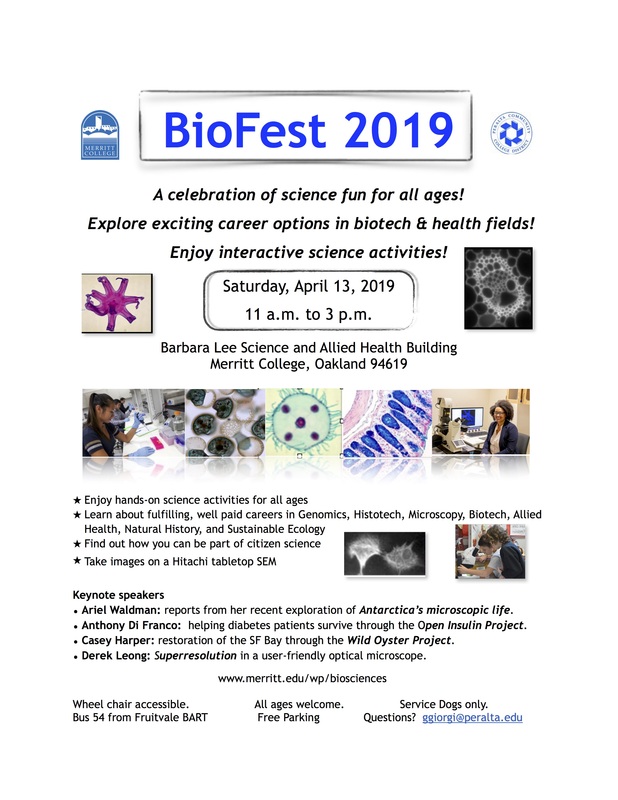 The show includes an interview with Microscopy student Kayla Pelletier, a visit to Biofest, a brief lesson in anatomy, and a video of the Histotechnology Program.